BW is a professional cutter manufacturer. Above photo is new developed portable compound sharpener of end mill and tap. Compound grinder may assemble two functions, re-grinding end mill, drill, tap, or carbide rod. For End Mill+Drill Sharpener, it apply to re-sharpen dia 2mm – 13mm, of square end mills with flute 2,3, 4, and 6 to make cutter sharp again. It may use fine diamond cutting wheel during re-grinding process to increase the surface smooth and decrease cutting scar. Adjustable grinding holder of central rake angle : grinding end, central rake angle, 2nd relief angle at the same time. And the re-grind end mills are over central point after sharpening. The right side of machine is for sharpening taps. It may re-grind carbide and HSS taps of 3-4 flues, dia M16 – M32, edge angle 5°-30°. It may grind correct angle of tap through adjustable grinding holder of central angle. Both sides of diamond cutting wheel could be applied, which may promote efficiency. CBN400-200 wheel may reach fine surface of cutter and decrease cutting scar of work piece.Break tap will influence the quality of work piece. The portable sharpener may be used in time, very flexible in usage. 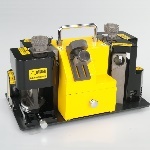 BW tool sharpener weight 12-15 kg, pilot angle from 5°-30°, power AC110 and AC220 50/60Hz, 6000 R.P.M. It may cut the broken cutter and re-grind the head of end mill. Very efficient in the short time and cost saving. Convenient in usage, precise, speedy, and cost saving, which is very good for factories.